Your time is valuable. So when your Toyota or Scion needs factory-scheduled maintenance or minor repairs, don’t let it slow you down. Toyota Express Maintenance offers everything you need to keep you moving. 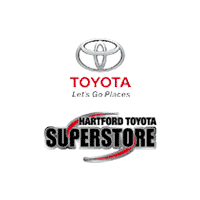 All from the one place you trust to do it right — Hartford Toyota Superstore. If you live or work in the Hartford area you can rest assured that servicing your vehicle at Hartford Toyota will allow you to quickly hit the road with confidence. Contact us today to schedule your next Toyota or Scion maintenance service visit. We have the right price, provide the right quality, and can do it right now! Why is vehicle servicing important? Regular maintenance is essential to obtaining the highest level of performance, safety and reliability from your Toyota or Scion. It can also increase your vehicle’s resale value. With proper maintenance and care, your vehicle will last longer and deliver more dependable, economical performance. In addition to scheduled maintenance, your vehicle requires ongoing general maintenance such as fluid checks and visual inspection. Following the manufacturer’s recommendations will allow you to enjoy maximum reliability and peace of mind from your Toyota or Scion for many years to come. It improves fuel economy by increasing the efficiency of your engine’s oil system – more miles per gallon. It reduces engine friction and provides uniform lubrication throughout the engine to help prevent engine deposits – more engine protection. It provides a quicker oil flow to critical parts of the vehicle resulting in faster starts and better overall engine protection over a wide variety of temperatures – more stability under a wide range of temperature conditions.